Do Consumers Understand Drug Ads? If you've ever watched television, you've seen plenty of drug ads. They urge you to take Lunesta to get to sleep, Lyrica to battle aches and pains, Cymbalta when "depression hurts." And if the commercials seem more pervasive than ever, that's because they are. Drug makers spend nearly $5 billion a year to make sure you're hearing about their products  a sound investment considering that every $1,000 they spend translates to 24 new prescriptions, according to the House Commerce Committee. But as industry spending has soared, so has public scrutiny. Last week, at a day-long House subcommittee hearing, lawmakers pushed for tougher regulations, taking aim at seemingly deceptive ads by drug companies such as Pfizer and Merck. And on Thursday, the U.S. Food and Drug Administration (FDA), which mandates and monitors the content of drug ads, convened to discuss the issue. It seems the inquiries are coming just in time. A commentary in the May 22 issue of the New England Journal of Medicine highlights a potentially risky shift in direct-to-consumer (DTC) ads  from drugs to devices. Last Thanksgiving, Johnson & Johnson launched its new TV commercial for Cypher, a drug-coated coronary stent, designed to prop open narrowed arteries. "To many consumers, the stent ad may not have seemed surprising or out of place," write the authors of the NEJM article. "But in making the leap from pharmaceuticals to medical devices, the ad campaign raises important questions regarding the net societal benefit of medical advertising." For one thing, the authors note, the ad for Cypher was targeted at a lay audience of millions of people who couldn't possibly judge the subtle pros and cons of a therapy that even specialists continue to debate. Ruth Day, a researcher at Duke University, has been studying drug commercials since the late 1990s. She and her small staff at Duke's Medical Cognition Laboratory record hours of television every day, isolate drug commercials, and systematically measure their "cognitive accessibility." It's the kind of research that also helps Day explain how well, for example, jurors understand instructions given in court. Day (whose research is not funded by either the industry or the FDA) analyzes ads for their linguistic complexity, speed of voiceovers, visual distractions and the timing of when information is given about drug benefits and side effects  all to help determine how easy it is to understand and remember the information presented. It's commonly understood by psychologists  and ad makers  that if a person is presented with a list of things, he or she is more likely to remember items at the beginning and at the end of the list than items just past the middle. For example, if you are asked to hear, then recall, a list of 10 foods, chances are best that you'll forget the sixth, seventh and eighth foods. So, while drug makers abide by the law and present important side effect information, it's no surprise that they nearly all follow the same format: putting benefit information in the first half of the commercial, side effect information just past the middle, then benefit information again at the end. Merck/Schering-Plough's one-minute ad for the cholesterol-lowering drug Vytorin is a standard example: it repeats the drug's benefits over and over, but squeezes in risk information only once and just after the halfway mark. You won't see it on TV anymore  the drug maker pulled the ad in January after releasing results of a two-year trial that showed Vytorin was no better than a cheaper generic statin drug at preventing heart disease  but you can watch our dissection of it below. Drug ads can be helpful to consumers, according to the NEJM article, prompting patients to seek new treatments, ask better questions of their doctors and solicit advice for medical conditions that might have gone untreated. But the potential for confusion is undeniable, as Day's data attests. Sometimes the ads employ crafty timing or visual distraction to deemphasize the risks. Sometimes they do so simply by using complex language: in a study of 29 drug ads that Day conducted in 2000 and 2001, Dayfound that, on average, benefit information required a sixth-grade level of language comprehension, while side effect information required a ninth-grade level. At the House subcommittee hearing last week, Day presented similarly eye-opening data on several DTC drug ads. Here's how they stacked up. Among DTC ad makers and drug companies, the Nasonex bee, created by ad giant BBDO, is something of a celebrity. 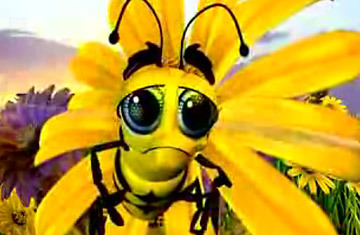 (A version of the Nasonex bee ad was the most remembered new drug ad of 2007, according to IAG Research, a subsidiary of Nielsen.) In one version of the ad for the prescription allergy nasal spray, a cartoon bee  sometimes voiced by Antonio Banderas  flies around the screen discussing his own allergy problems, then, after a spray of Nasonex, the bee returns to a flower, saying he is "a changed bee." Day reviewed a 2005 version of the Nasonex ad and found that test subjects had difficulty recalling the side effects mentioned in the commercial. (Here's a link to an early version of the ad, not the specific commercial Day studied  drug-makers continuously tweak ads after they're launched.) When Day studied the 2005 ad, she found several visual distractions that influenced viewer comprehension. During a voiceover about side effects, the bee flew from side to side, its wings flashing and flapping nearly four times per second. At the end of the commercial, when a voiceover talked about the benefits of Nasonex, the bee hovered in place and its wings flapped about once per second, with no flashing. After Day presented her research publicly at the end of 2005, Nasonex pulled that particular ad and created three new ones  one in which the bee had less distracting black wings, one in which the bee's wings weren't visible, and one with no bee at all. In 2005, Day recorded ads for Ambien and Lunesta, both popular sleep aids. (Here's a link to a version of the Ambien ad  similar to, but not the actual ad Day studied.) Each drug ad mentioned five side effects. The Lunesta commercial's narrator spoke at the same syllable-per-second clip for the entire ad; the Ambien ad's voiceover speed was about five syllables per second during the explanation of benefits, but accelerated to eight syllables per second when explaining the potential side effects. In a test of viewer comprehension, Day found, predictably, that people remembered far fewer side effects from the variable-speed Ambien ad than from the consistently paced Lunesta ad. Shortly after Day presented her research, Ambien switched to a new ad  with a consistent voiceover speed for the entire commercial. Day's research on the new ad found that comprehension and retention accordingly improved. One ad that did a better job of helping viewers understand and remember risk information was for the bladder control drug Enablex, which features colorful bouncing water balloon characters. (Here's a link to a similar Enablex ad  again, not the one Day studied.) Day discovered that the voiceover speed was slower than in most drug ads and stayed consistent throughout the ad. Correspondingly, when Day tested viewer comprehension, they understood and remembered Enablex's side effect profile better than usual. The original version of this article implied that television advertisements for Cypher were the first direct-to-consumer advertising for a medical device. Cypher was the first company to advertise percutaneous transluminal coronary angioplasty with drug-eluting coronary stents, but other types of medical devices had been advertised on television previously. Also, a previous version of the article stated that Duke researcher Ruth Day had no financial connection to the Food & Drug Administration. She has worked as a consultant for FDA in the past, but her research is not funded by FDA.